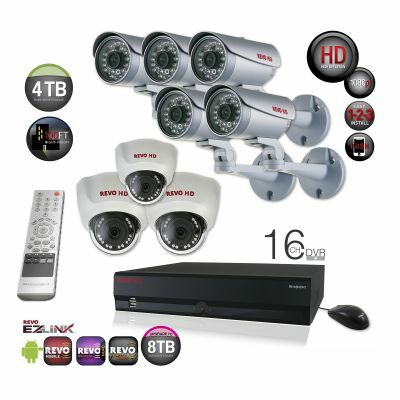 REVO’s professional 16-channel high definition surveillance system is perfect for small to large homes and businesses. Unlike other HD systems, REVO’s new HD system is very user friendly. The HD NVR supports plug and play functionality and automatic network detection/settings that will result in a system that is quick and easy to set up. REVO’s HD NVR has some intelligent features including EZLINK, Push notifications to most smartphones, email notification with attached video clip or jpeg image, and video blind. The 2 Megapixel resolution cameras provide a sharp, crystal clear picture. The twelve bullet style die cast metal cameras included in this system are weather resistant (IP66 rated) and come equipped with a mounting bracket. The four indoor domes and all the bullet cameras can see up to 120 FT in total darkness. 100 ft. of CAT5e cable is included with each camera. You'll never have to worry about how to get power to your cameras with the REVO HD NVR plug and play security system. The HD DVR has a built-in 8 CH POE switch that can power 8 cameras. The other 8 cameras can be powered via the included multi-port PoE switch that connects to the back of the HD DVR. The switch has been optimized to allow seamless control and communication between the two devices. A 23’’ wide screen LED HD monitor is included as well. This professional, cost effective HD system has REVO EZLINK to automatically network your DVR on most routers for remote/viewing operation. In Fact, REVO's advanced PENTAPLEX™ technology maximizes the NVR by allowing you to View Live Video/Record/Search and Playback/Back up/Access DVR Remotely, ALL AT THE SAME TIME! The massive 8TB Hard Disk Drive allows for months of video storage capacity, depending on your settings. Advanced. Intelligent. Video Surveillance. REVO HD!